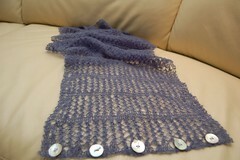 I have been knitting my little heart out the last few weeks, but I had nothing blog worthy to show for it. BSJ is uber lovely, but took a couple of weeks and then the rest of the set... well, I am ahead of myself. 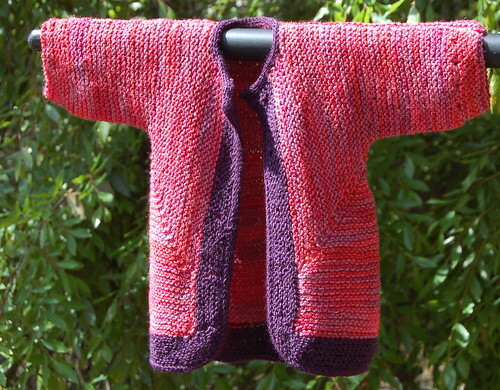 Here is the Baby Surprise Jacket by Elizabeth Zimmerman. Yarn is Schaefer Farms Heather in Merino, Nylon and silk. 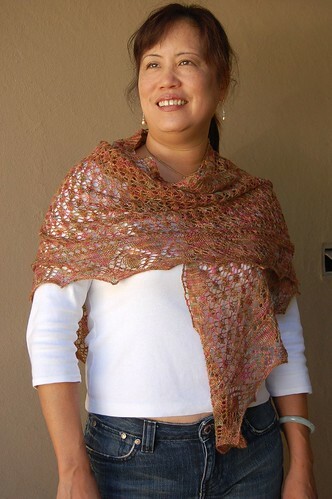 The trim is Knit One Crochet Two's Ambrosia in Marino, Silk and Cashmere. 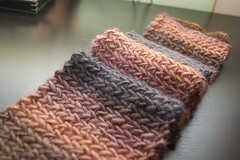 Yes, I know I might have been smoking the knitters equivalent to crack when I made my yarn choice. Yes, I am completely aware that this will be covered in smelly baby spit up in nothing flat. I have had two of those fluid producing machines of my own, thank you very much. But hear me out, there is logic 0 for me, at least. If I were to go out and buy a baby presetn I would have spent as much or more than the yarn that I purchased at Unwind's Superbowl Sale. I got to work with this divine stuff, hear all the lovely compliments from my knitterly friends as I knit it (as well as the giggles that I would do such a silly thing) and I will have the pleasure of the Mom's pleased surprise at such an extravegant gift. (Reality will set in shortly, but that's not my problem, it's hers!). In the end it is all about the process, and I enjoyed every moment of this process! I added i-cord to the trim and neck. The ambrosia is really floppy at this gauge, so I think the i-cord really helped give structure. I had lots of yarn left so I made this beanie. 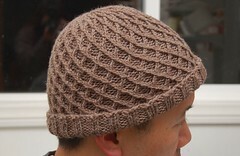 I needed the perfect unfussy hat to match my BSJ, but I guess my needs were too simple for a pattern! Searched high and low and, in the end, just wung it. 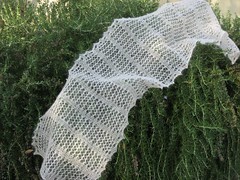 60 stitches on double circ, 2 rows CC, knit 4 inch straight in garter. Dec round = (k8, k2tog) then purl round and continue, decreasing 1 stitch between k2tog for each dec round and alt dec knit round w/ straight purl round until 6 stitch remain. 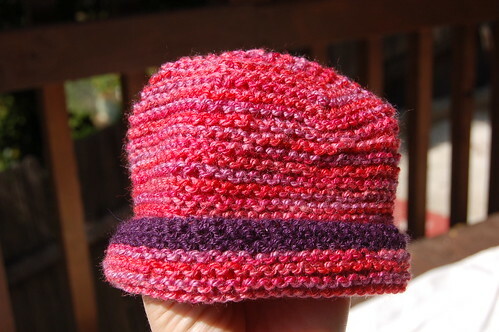 Thread needle through remaining stitches, pull tight and fasten off inside hat. But there was still more yarn. 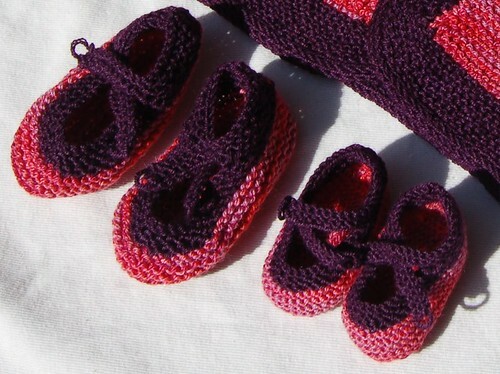 So I made Saartje's Booties using #2 and all the same yarn. Too cute, no? Actually, these are my second try. 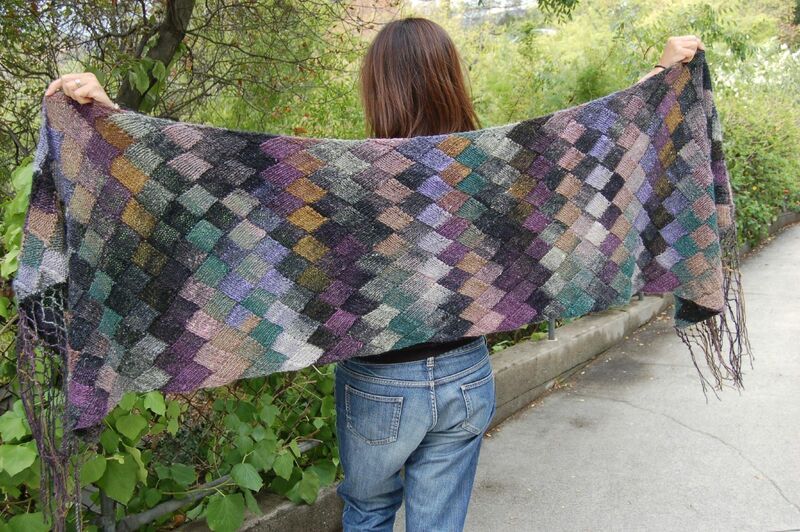 The first were knit with a #4 and are humongous - see? I'm going to give them both to the mother. The great thing about babies is that they grow!! Lastly, I am still sloggin away at Oblique. I am totally enjoying this, but, MAN! a huge slouchy sweater on #7's is not a quick knit. I have 1/2 of a front to go and them it is time to pick up stitches for the collar. 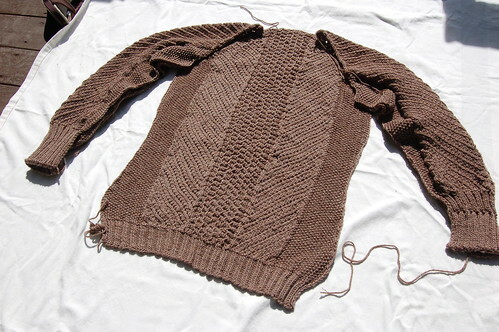 At this rate I should finish this just in time for the 90' weather.